When provincial accountant Gideon Manda returned home to Mendi after a year spent studying in Port Moresby, he knew he wouldn’t be able to create change overnight. But, armed with new knowledge of the ethics and transparency standards required at provincial government level thanks to studies at the Pacific Leadership and Governance Precinct, he felt confident he would be able to start making an impact. Mr Manda graduated with a Diploma of Government (Financial Services) in December 2015. The year-long, full-time course was delivered by trainers from Australia-based CIT Solutions at the Papua New Guinea Institute of Public Administration (PNGIPA), and facilitated by the Precinct. Since resuming his role with the Southern Highlands Provincial Government, Mr Manda has been applying principles from the Australian Public Service Code of Ethics and Values to improve accounting processes and decision-making. “Australia and PNG are quite different geographically and politically, but when it comes to the management and accounting of public funds, the principles are the same,” he explains. “One of the most important things I learnt through the course was the Australian perspective on public sector financial management, especially in preparing budgets and submitting them on time, as well as preparing annual financial statements and expenditure control from a government point of view. We also looked at ethics and values. As the only person in his department to undertake the Diploma course, Mr Manda has guided the nine officers working under him, as well as more senior colleagues, to embrace these new approaches. He says that, slowly, things are changing. “The Public Service Finance Management Act is one that the whole country uses, and we have to apply it here. People here have to learn that the processes involved in performing our duties are according to acts and policies of government, but most of our people here don’t understand that. They think we are doing the wrong thing and they are doing the right thing, but as agents of change we have to start somewhere. Tauedea Miana, a Paying Officer at the Department of Treasury in Port Moresby, graduated from the Diploma of Government (Financial Services) course alongside Mr Manda. Tauedea Miana at the Department of Treasury in Port Moresby. At a time of considerable change and workload at the Treasury, she says she now feels better equipped to contribute to her team. “Before, I wasn’t very confident in checking the records and checking a claim to be cleared for the cheque run, but now I’ve done the course, it has given me the confidence to do my job better,” Ms Miana explains. 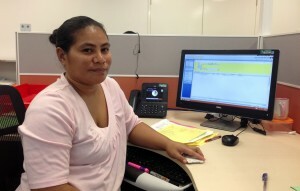 Ms Miana is also drawing on her Diploma knowledge to help her Treasury colleagues clear a long-standing backlog in bank reconciliations, which is now being addressed through the PNG Government’s newly implemented Integrated Financial Management System (IFMS). She explains: “We started last week, and I’m hoping I can use the things I learned from the course to assist with the bank reconciliation for this year, and all the way back to 2011”. Mr Manda has applied to further his training through an Australian Endeavour Executive Fellowship and, if successful, will be hosted by the Victorian Department of Treasury and Finance in early 2017 to gain practical knowledge of budgets and expenditure control in an Australian state government context. Gideon Manda and Tauedea Miana studied for a Diploma of Government (Financial Services) in 2015, delivered by Canberra-based CIT Solutions at the Papua New Guinea Institute of Public Administration, and facilitated by the Pacific Leadership and Governance Precinct. The Precinct is a joint initiative of the Governments of PNG and Australia to promote ethical leadership and strong governance within the public sector at the national, provincial and district level.